Zachary L. Bayne - Tampa Full-Service Law Firm | Allen Dell, P.A. Zachary Bayne is a shareholder with the law firm of Allen Dell, P.A. where he focuses his practice in the areas of marital and family law. Mr. Bayne is active in the legal community, currently serving on the Executive Council of the Hillsborough County Bar Association Family Law Section, the Executive Committee of the Tampa Family Law Inn of Court, and as Co-chair of the Hillsborough County Bar Association Young Lawyers Division Events Committee, as well as serving on several Florida Bar Family Law Committees. 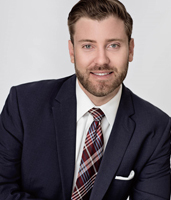 Outside of his legal practice, he is active in many community service programs including serving on the Board of Directors of the Pinellas & Pasco Heart Gallery and volunteering as a Big Brother for Big Brothers/Big Sisters of America. He also devotes his time to his wife, their daughter, and their two dogs. Mr. Bayne concentrates his practice in marital and family law which includes dissolution of marriage litigation, domestic violence, paternity actions, spousal and child support, timesharing and post judgment matters.